Every time firestarter starting GUI it will prompt for root password may be this is bit difficult for this you can do the following steps to avoid password. Replace %ruchi by your the name of the user or the group which can use sudo and do the modification. 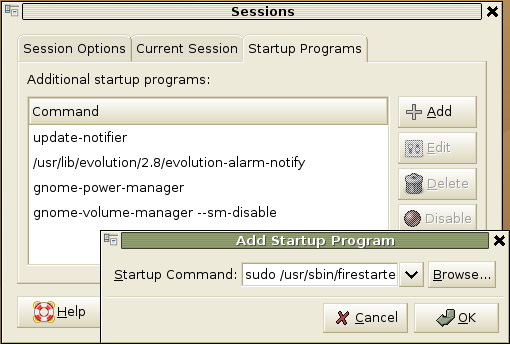 Finally you need to add firestarter to startup programs list from system---> Preferences--->Sessions you should see the following screen in this you need to click on startup programs and click on add you should see a popup box prompting for startup command in this you need to enter the following command and click ok two times. All inbound network traffic that is not in response to a connection established by a secured host is always denied. User created inbound policy is therefore permissive by nature and consist of criteria that when met lift the restrictions on the creation of new incoming connections. 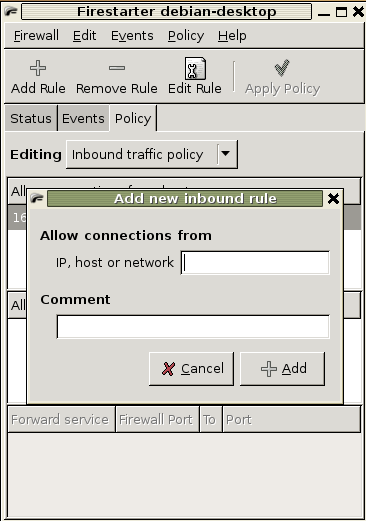 Changes to inbound policy are made on the inbound policy section of the policy page in Firestarter. 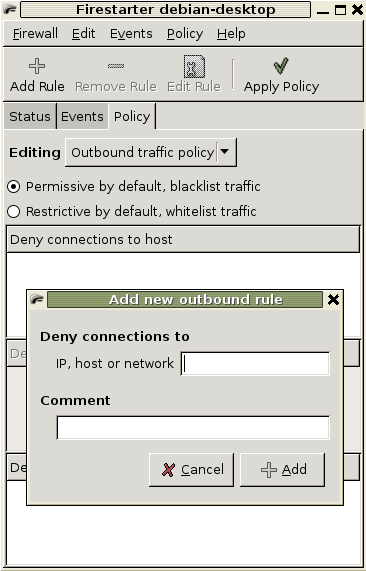 The purpose of outbound traffic policy is to specify the types of network traffic that are allowed out from the secured network to the Internet. 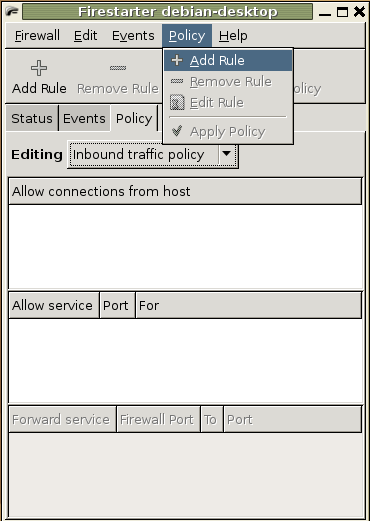 Firestarter has two modes of operation when it comes to implementing outbound policy, a permissive (which is the default) and a restrictive mode. the numbers after “firestarter:” change at random when trying it again, still I don’t know what that means. Any ideas to get this working? sometimes if you are trying to run as root you will get this error. 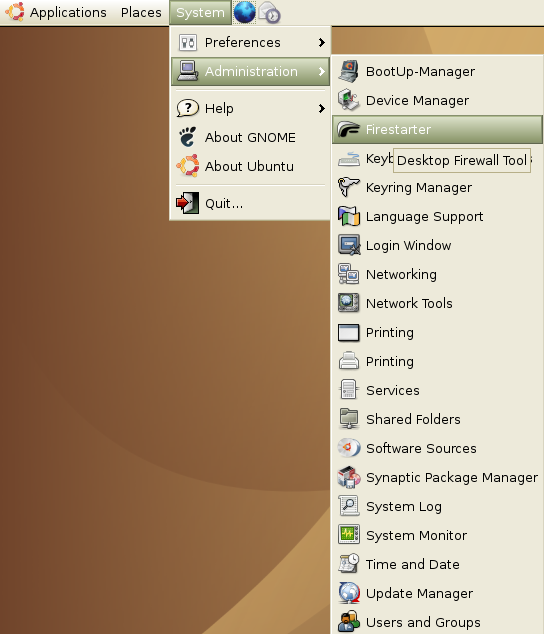 Another question is, can I make firestarter run at boot for all users of my pc, even if they’re not in the admin group? All hints and ideas appreciated. From my understanding firestarter should start up as a service no? BTW, Admin, I think you are running a fantastic site! but i’m still prompted for the password. There seems to be a bug in /etc/sudoers. Use this link, it worked for me. 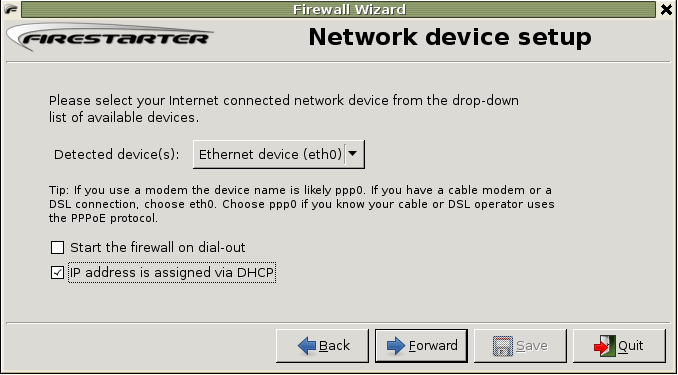 I just installed feisty on a box, installed firestarter, ran the gui and added some stuff to be blocked etc and I clicked the “ip address is assigned via dhcp”. The firewall works fine until I reboot – after reboot there is no protection at all. and then make it executable (using chmod +x). Is this is a bug in ubuntu? Replace “ruchi” by your the name of the user or the group which can use sudo and do the modification. Firestarter won’t start when I use a ppp0 to GPRS connection, which is my only alternative here in the Andes mountains. 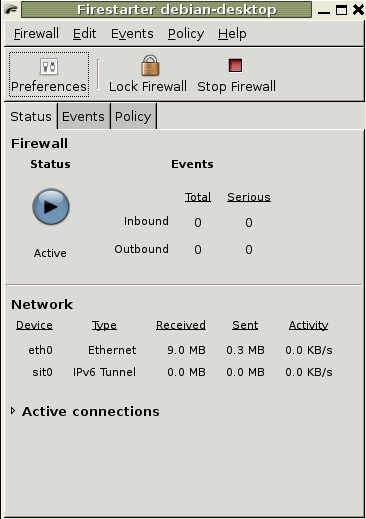 I am not happy with an open connection and no firewall. 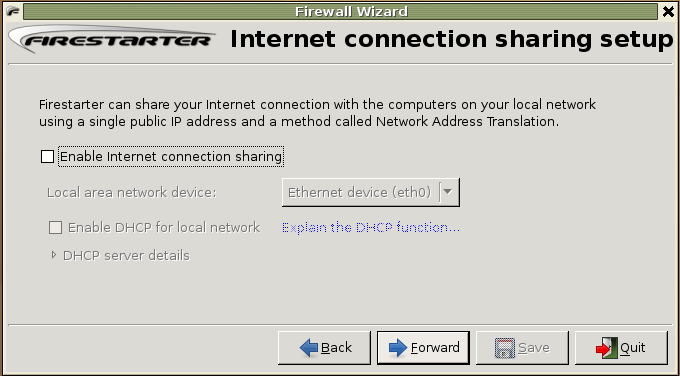 Does Firestarter use netmanager, which has a known bu re. ppp0? adds a file named by my ip-address to the desktop on UBUNTU 8.0.4. 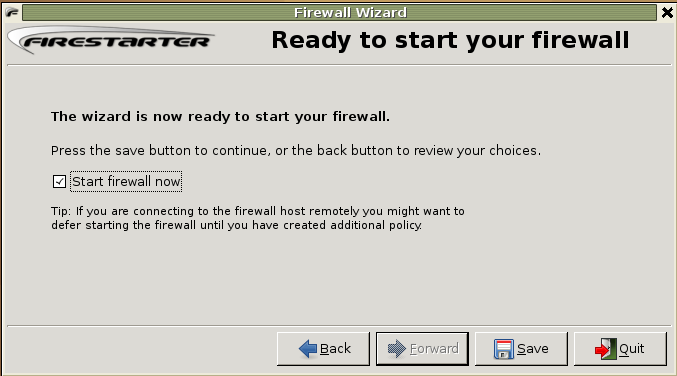 For one if this Firewall is going to be supported or used in Ubuntu than it should be configured to auto start with boot in the installation of Firestarter. Relating all to users in previous posts and than having new users reading the posts will do nothing but totally confuse them. 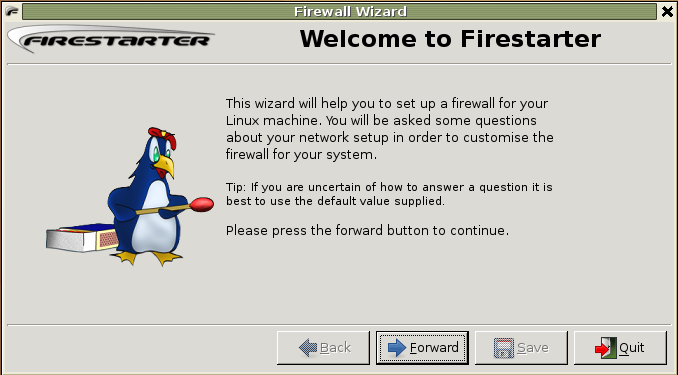 Even Linux operating systems need a firewall but having a firewall which requires a user to start it each time they boot or reboot is inane. I use both openSUSE and Ubuntu and openSUSE installs a firewall on installation of the operating system so why cannot Ubuntu do this? 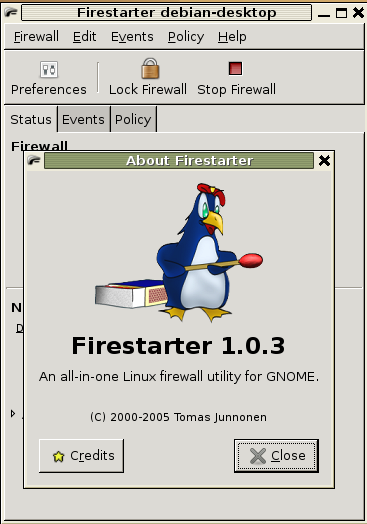 What good is Firestarter if it does not install with a auto start up at boot? ?